Watch the incredible TRS 1100 rock cutter slice through a cement wall as if it were nothing! Deep rocky trenches, cement blocks and, yes, even a thick cement wall are no match for the power of this dynamic rock saw. The TRS 1100 is a one-machine wave of destruction capable of reducing urban blight to a pile of rubble in a matter of minutes. 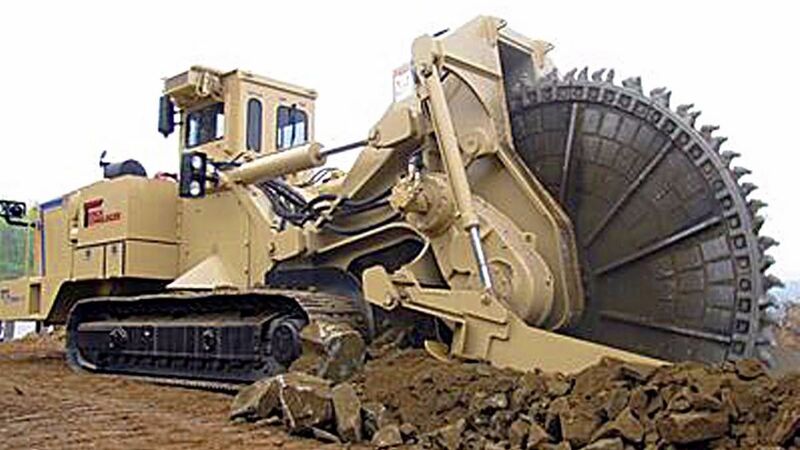 Able to rip through cement and rock, the TRS 1100 is outfitted with a powerful six inline cylinder 385-horsepower C-13 Caterpillar ACERT engine. The hydrostatic drive consists of two motors and two pumps that deliver the full 385 horsepower. The engine turns at 2,130 rpm with no load. There’s a 266-gallon (1,000 l) fuel tank, and at a burn rate of 17.6 gallons per hour (66.6 l/hr. ), the TRS 1100 is designed to get in a solid day’s work at the job site. According to Innovators Equipment, the unit is mounted on tracks 138 inches (351 cm) long and 23 5/8 (60 cm) inches wide. Operators can select from variable digging speeds, up to 800 fpm (244 m/min.). The cutters on the saw are a rotary carbide-tipped shank that is 1 inch (2.5 cm) in diameter; 1.5-inch (3.8 cm) shanks are available as options. The unit has an 8-foot (2.4 m) boom and weighs in at 75,000 pounds (34,020 kg). In keeping with the high standards of Tesmec products, the pressurized ROPS cabin is designed with operator comfort in mind. It includes heating, sound dampening and air conditioning. 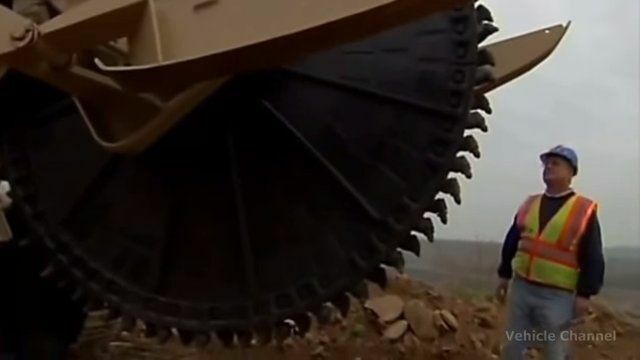 See this mega rock cutter in action in the video below, and SHARE if you like it.